Monsters Inc. was Pixar Animation Studios fourth computer animated film to be released by Walt Disney Pictures. 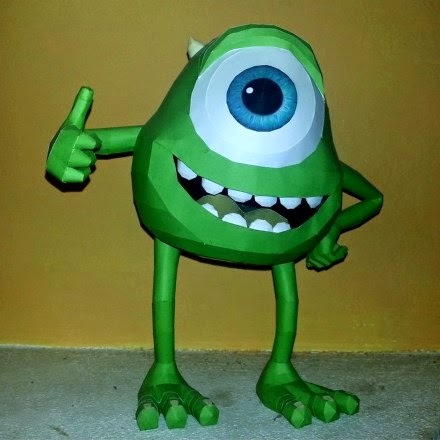 This paper model is of Mike Wazowski, one of the lead monsters in the movie. Mike's job (as with all the monsters in his world) is to scare children in their bedrooms at night. The model of Mr. Wazowski was created by DeviantARTist, LordBruco. The template may be downloaded here. Released in 2010, Assassin's Creed: Brotherhood is the third installment in the Assassin's Creed video game franchise. 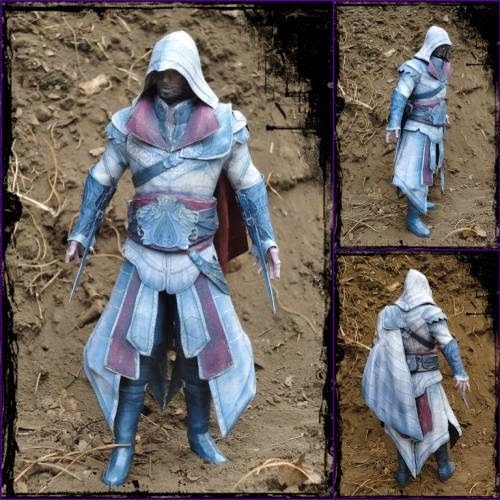 Pictured here is a paper model of the main character of the game, Ezio Auditore da Firenze, a 16th century assassin. This excellent model was created by Sanek94cool. 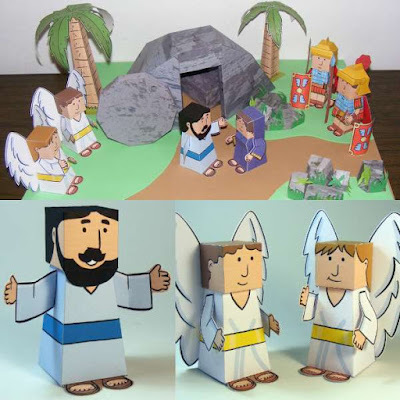 A download of the Pepakura PDO template is available here. Build photo by DeviantART member BRSpidey. In the Command & Conquer: Generals video game, the US and China cooperate to eliminate a terrorist organization that seeks to eliminate the military forces of both superpowers. This paper model is based on a 3D model of the Chinese Overlord tank seen in the game. 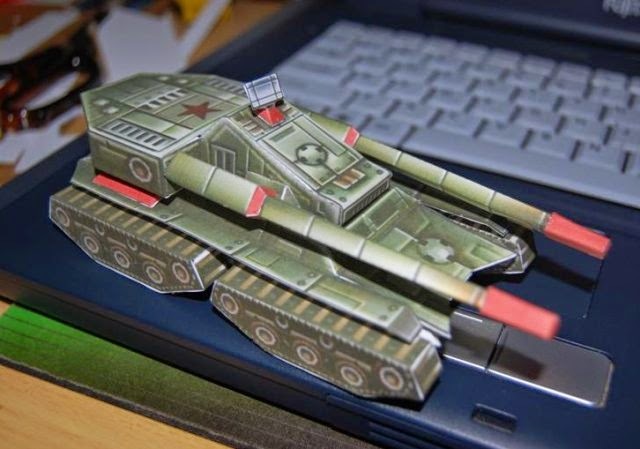 The PDF template for the tank may be downloaded at Command and Conquer Papercrafts. The download includes several different accessories for the tank including a radar dish and a Gatling cannon. 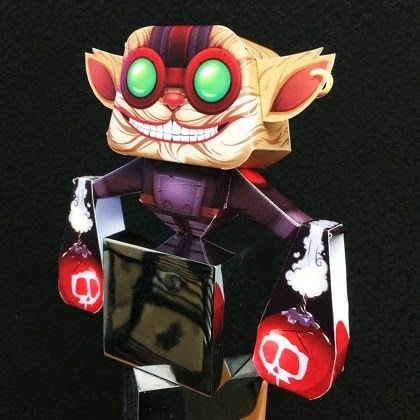 This paper toy of the League of Legends character, Ziggs, was created by artist Jarrett Quon. The toy is intended to be able to balance on string or wire, using the two bombs as ballast. Jarrett based his design on Sal Azad's "Acrobat Monkey" paper toy. A download of the template for the toy may be found here. In the League of Legends video game, Ziggs is a demolitions expert who invents a line of powerful bombs he calls "hexplosives". Building this detailed paper model of a samurai-like robot is not for the faint-of -heart. 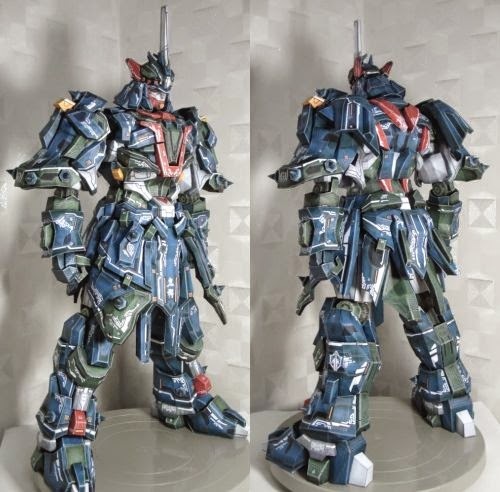 The model has 493 parts contained on 54 pages, yet the finished piece stands only 22" (55 cm) tall. Papercraft designer Gwijang found the inspiration for his creation in the 1970's South Korean cartoon, Robot Taekwon V. PDF and Pepakura PDO templates may be downloaded from here. Build photos by Sinsis. Yikes! Valentine's Day is upon us! For those in need of a DIY Valentine for a loved one, here is an easy but elegant solution. On the outside, this "matchbook" card has a heart-shaped cut out that hints at what's inside. 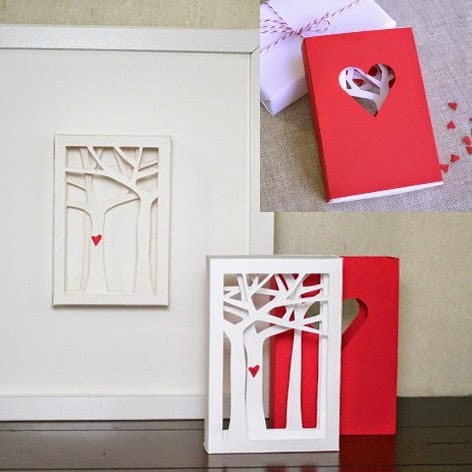 When the insides are removed, it is revealed to be a white grove of trees with a tiny red heart on one. The heart may be customized to have the initial of the recipient of the card. As the photo shows, the inside of the card may be displayed as art year round. Nice! This valentine was designed by Patricia Zapata. A printable template and instructions may be found here. Sipho Mabona has a knack for creating origami that is both simple and elegant. Much like his popular origami koi installation, Mabona also created an art piece composed of a group of pastel colored origami swallows like the one pictured above. Mabona entitled the piece "Pursuit of Happiness". Instructional videos on how to fold your own swallow may be viewed here. 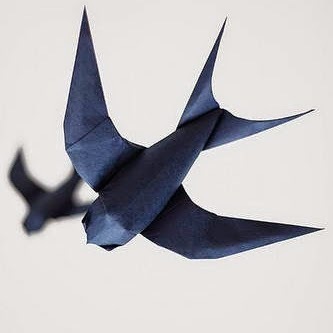 As with most origami, each swallow is folded from a single square of paper. You can always count on Kamibox for creative paper automata! One of his newest creations is this Minecraft "Machine". Depicted in the automata is Minecraft's Steve being intimidated by a creeper. In the video game, creepers are those unrelenting hostile mobs that explode if you let them get too near. Template downloads of this and the rest of Kamibox's papercraft are available here. 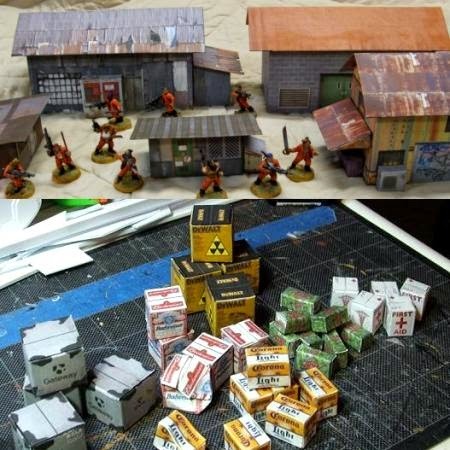 Miniature gamer, Tommygun, has a wide assortment of printable miniature gaming terrain available at the Imperius Wargaming blog. In addition to several dilapidated buildings, there are dozens of props such as vending machines, cardboard boxes, food containers, magazines, and a video game machine. All of the papercraft terrain is at 28-30 mm gaming scale. Downloads of the templates may be found here.